Strolling along Bloor Street in as late as 2008, just west of the Intercontinental Hotel, one could turn north up a narrow alleyway and after only a few dozen steps come across a little piece of urban paradise, the elegant John Lyle Studio building. Adjacent to a peaceful, sunshine- and art-filled courtyard, the studio and grounds were a quiet refuge from busy Bloor Street. The studio was built by John Lyle in 1920 as the atelier for his architectural firm. 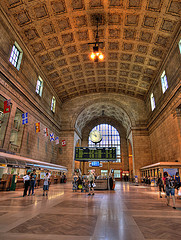 Lyle was one of Toronto most distinguished architects in the late 19th and earliest 20th century. Born in Ireland in 1872, he came to Canada as a young boy, and settled initially in Hamilton, Ontario, where he was a student at the Hamilton School of Art. He studied architecture first at Yale University, and then at the Ecole des Beaux-Arts in Paris France. Upon his graduation in 1896, he worked for a number of distinguished architectural firms in New York City. He was involved in the design of the New York’s Beaux-Art gem, the New York Public Library. 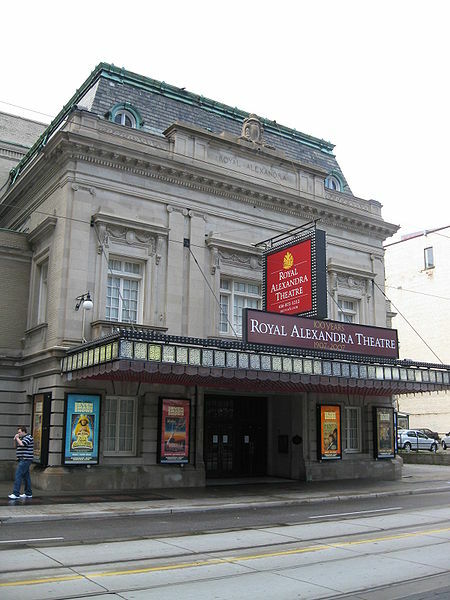 Among Lyle’s most accomplished buildings are the Royal Alexandra Theatre (1907), Union Station (1921) and the Runnymede Branch of the Toronto Public Library (1930). Lyle continued his architectural practice from the studio until his retirement in 1943. He died in 1945. 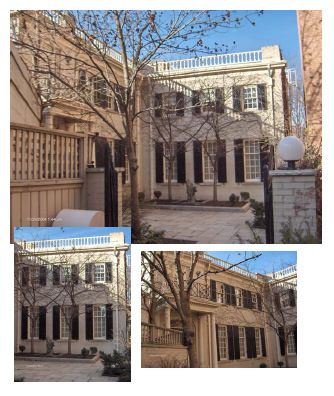 His studio continued to be occupied by various tenants, most recently by Cara Operations Inc. In about 2004 the studio lands were included in a proposal by Lanterra Developments and MCE Developments to erect a 32 story condominium tower they called One Bedford. The construction of this tower would necessitate the demolition of all of the buildings on the north side of Bloor Street from Bedford Avenue east to the Intercontinental Hotel, including the Lyle studio. Despite being listed in the City of Toronto Inventory of Heritage Properties, the developers obtained all necessary permissions to tear down the studio in 2006. 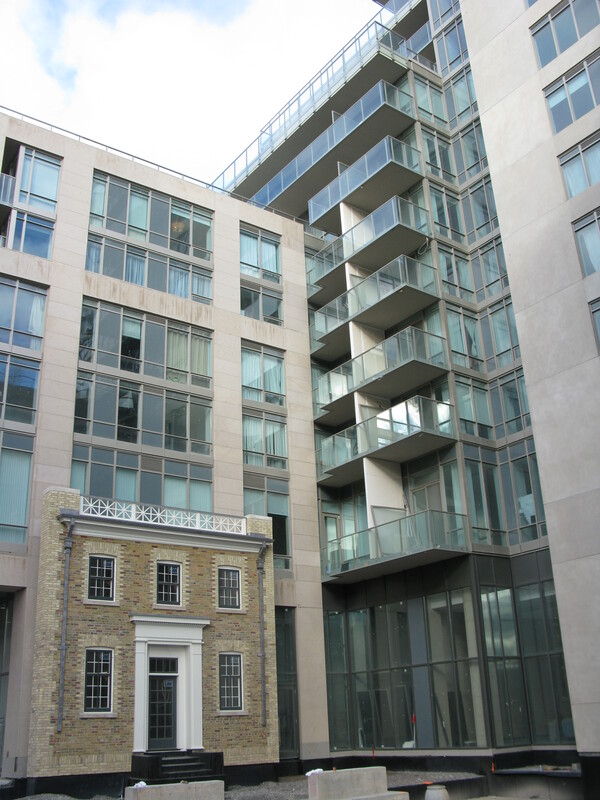 Eleventh-hour protests by local historians and the community brought only one small concession, the preservation of a fragment of the building facade, to be placed on the exterior of the condominium’s inner courtyard. The One Bedford condominium is nearing completion. The fragment of the Lyle Studio facade on the Bruce Kuwabara/Shirley Blumberg and Sol Wasserman/Vlad Losner-designed tower has just recently been unveiled. It demonstrates all of the weaknesses of facadism. Derided by preservationists as vandalism that reduces the original building to a folly, the facade fragment of the once-elegant Lyle Studio appears like a small brown turd under a squatting gray man, diminishing both buildings, the old and the new. The sad demise of the John Lyle Studio is but another episode in Toronto’s ignominious history of heritage preservation.